Balmoral Commences Initial Explorat… | Balmoral Resources Ltd.
(Vancouver, January 31, 2018) Balmoral Resources Ltd. (“Balmoral” or the “Company”) (TSX: BAR; OTCQX: BALMF) is pleased to announce that it has commenced its first exploration program on the HWY 810 property in Quebec. The wholly owned HWY 810 property was acquired by Balmoral through staking in 2016/2017. 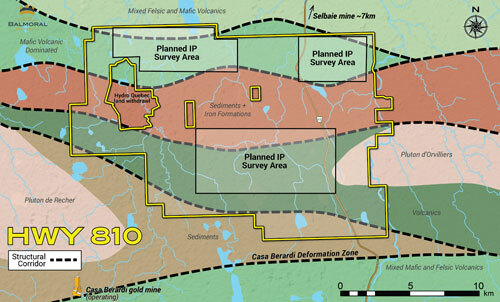 The property covers over 250 square kilometres and is centered 15 kilometres northeast of Hecla Mining’s multi-million ounce Casa Berardi gold mine and 35 kilometres south of Balmoral’s Martiniere gold property (see Figure 1). Balmoral has commenced a minimum 120 line kilometre I.P. program targeting three areas of this district scale land package (Figure 2). The target areas were identified through a compilation of historic work and modeling as having potential for mesothermal gold mineralization using criteria derived from the Company’s knowledge of the numerous deposits and active gold mines in the region. The I.P. results will be incorporated into the selection of targets for initial drill testing. Like the Company’s Martiniere Property, historic exploration on the HWY 810 property appears to have predominantly focused on the base metal potential of the area, with only minor effort directed toward structurally controlled gold deposits similar to those at Detour, Casa Berardi and Martiniere. The HWY 810 property extends across three Archean geological domains and contains regionally extensive structural elements similar to those hosting significant gold deposits elsewhere in the Abitibi region. The northern part of the property is characterized by mixed mafic/felsic volcanic rocks and gabbroic intrusions, while the central and southern parts are characterized by mafic volcanic rocks with interbedded pyrite rich, graphitic sediments. This latter sequence is intruded, along a structural corridor, by a large intermediate pluton. The property includes, or surrounds, several known precious and base metal occurrences, as well as a regionally extensive iron formation sequence. In addition to gold, there may be potential for the discovery of Cu-Zn VMS mineralization on the property given its location between the former producing, 50+Mt Selbaie Cu-Zn-Ag-Au mine to the north and the Estrades gold-rich VMS system to the south. As the name indicates, the property enjoys excellent access, via an extensive logging road network connected to regional Hwy 810 which cuts north-south through the property. The Company currently uses Hwy 810 for access to its Martiniere and Grasset deposits. At Martiniere, the camp has now been opened in preparation for winter geophysics and drilling. The Board of Directors of the Company has approved a winter 2018 exploration budget of $2.0 million which is fully funded from cash on hand. Details on the winter 2018 drilling and geophysical program at Martiniere will be forthcoming shortly. Mr. Adrian Newton (P.Geo.- B.C., Temp Permit Que.) Exploration Manager of the Company, is the non-independent qualified person for the technical disclosure contained in this news release. Mr. Newton has reviewed and approved all of the technical information contained herein. Balmoral is a well-funded, Canadian-based company actively delineating and expanding a series of gold deposits and recent discoveries on its Martiniere Property located within the prolific Abitibi greenstone belts in Quebec, Canada. The Martiniere Property is just one of several large, highly prospective properties comprising the Company’s 1,000 km2 Detour Gold Trend Project. Employing a drill focused exploration strategy in one of the world’s preeminent mining jurisdictions, Balmoral is following an established formula with a goal of maximizing shareholder value through discovery and definition of high-grade, Canadian gold and base metal assets. This press release contains forward-looking statements and forward-looking information (collectively, “forward looking statements”) within the meaning of applicable Canadian and United States securities laws. All statements, other than statements of historical fact, included herein, including statements regarding the anticipated content, commencement, duration and cost of exploration programs, anticipated exploration programs and expenditures, the discovery and delineation of mineral deposits/resources/reserves, the timing of the receipt of assay results and resource estimates, the prospective nature of the Company’s land holdings, the nature and style of the mineralization discussed and its interpreted continuity, interest of investors in the results generated by the Company’s exploration activities and business and financing plans and trends, are forward-looking statements. Forward-looking statements are typically identified by words such as: believe, expect, anticipate, intend, estimate, may, postulate and similar expressions or are those which, by their nature, refer to future events. Although the Company believes that such statements are reasonable,there can be no assurance that such statements will prove to be accurate, and actual results and future events could differ materially from those anticipated in such statements. The Company cautions investors that any forward-looking statements by the Company are not guarantees of future performance, and that actual results may differ materially from those in forward-looking statements.Important factors that could cause actual events and results to differ materially from the Company’s expectations include those related to weather, equipment and staff availability; performance of third parties; risks related to the exploration stage of the Company’s projects; market fluctuations in prices for securities of exploration stage companies and in commodity prices; and uncertainties about the availability of additional financing; risks related tothe Company’s ability to identify one or more economic deposits on the properties, and variations in the nature, quality and quantity of any mineral deposits that may be located on the properties; risks related to the uncertain nature and interpretation of geological and geophysical models, risks related to the Company’s ability to obtain any necessary permits, consents or authorizations required for its activities on the properties; and risks related to the Company’s ability to produce minerals from the properties successfully or profitably. Trading in the securities of the Company should be considered highly speculative.All of the Company’s public disclosure filings may be accessed via www.sedar.com and readers are urged to review these materials, including the latest technical reports filed with respect to the Company’s mineral properties.